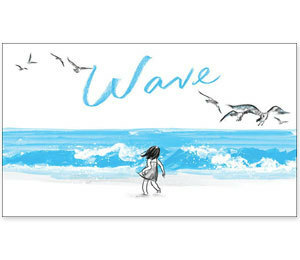 As summer comes to a rapid end, may I suggest a final hurrah… Wave, by Suzy Lee. It’s a story with no words, but full of warmth as a girl and a wave befriend each other and produce, as friendships often do, a surprise. Being a person of words, I imagine it’s challenging to tell a story without them. But Wave does it beautifully, the best I’ve seen since Tuesday and far more simplistic, yet not more juvenile. The use of one bright color, besides charcoal and white, is used masterfully to show the wave’s emotion and effect. I also like the supporting role of seagulls and cameo by mom. Through the playful illustrations and telling facial expressions, one can truly feel the subtleness of a blooming friendship. Wave touches, in me, a nerve that cannot be touched with words. It’s a primal sense that relationships cannot always be explained, but rather and simply – experienced. So like many great stories, this one speaks to different ages in different ways, with a thread: the ebb and flow of getting to know someone (or something) new. This is a book I’ll come to again and again with each new summer, full of fun, sun, and new discoveries.